I’m glad I didn’t write this prediction sooner! Tony Ferguson and Khabib Nurmagomedov have taken turns pulling out of fights with each other 4 times now and it seems likely that we may never have the chance to actually see that fight. That disappointment aside, something monumental has the potential to take place at UFC 223 and it’s because Max Holloway is an absolute wild man. When the call went out to replace Ferguson, Max Holloway, who is the current UFC featherweight world champion, answered the call for the chance to become the second fighter in MMA history to hold two world championships at the same time. It’s these kinds of spontaneous decisions that makes MMA fighters the toughest athletes in the world. On top of Max Holloway stealing the show with his moxy, this card also has the Women’s strawweight title on the line in a rematch between Rose Namajunas and the first woman to ever dominantly hold the title, Joanna Jedrzejczyk. Rose smashed the oddsmakers when she KO’d Joanna in their first fight and left jaws on the floor all around the world in the way that she did it. Standing on her feet, right where Joanna’s strongest skill set made her the most dangerous. As one of the best cards of the year unfolds, here are my predictions for the monumental last minute main event and the co-main event rematch. We have also included the UFC betting odds as of this writing. You can always get the current odds in real time from any of our recommended USA online sportsbooks. Confidence is the best asset to have as a fighter and it has skyrocketed for Max Holloway since his loss to Conor McGregor nearly 5 years ago. In that time, he has gone on a 12 fight win streak claiming the featherweight world championship and defended it against the first and most dominant featherweight champion in history, Jose Aldo. Max’s style is elusive, he starts a bit slow but really starts to gain momentum as he starts to figure his opponents out. He uses his length to execute a highly developed in and out striking style that allows him to stay at range with his opponents and use his weapons where they can’t seem to find range for their own. That should play to his advantage quite nicely in a fight against Khabib, who will undoubtedly need to close the distance. Despite his own greatness, he has never faced a wrestler the likes of Nurmagomedov and he is taking a fight with someone who is known for their ability to wear their opponents down over the length of a fight, without a training camp on 6 days notice. He’s a lunatic and I love it. Khabib Nurmagomedov is one of the only fighters in the history of MMA to keep his perfect undefeated record as he entered the UFC. He has 25 wins and 0 losses and all of those wins came by way of grinding beat downs. Coming from Dagestan with a powerful wrestling background, his legend grows as his training partners share stories of his wrestling. Daniel Cormier, olympic wrestler, UFC light heavyweight champion, and training partner to Khabib, has said he frequently goes to war with Khabib in wrestling despite having his own elite wrestling background and competing 3 weight classes above him. 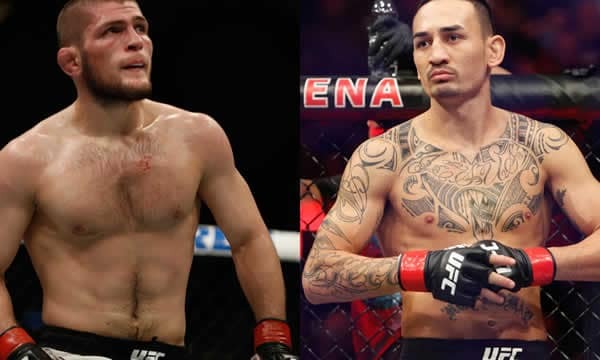 It has become clear in the UFC that there is no greater threat on 6 days’ notice than Khabib Nurmagomedov which increases my respect for Max Holloway infinitely. It’s no secret that Max has the striking advantage in this matchup. In that way you can look at this as a striker versus a wrestler. Khabib will need to close the distance and get a hold of Holloway, get him to the ground and start grinding and smashing. If he can do that, he can nullify the reach and striking of Holloway and grind out a unanimous decision win over the featherweight world champion, or even better, a TKO or submission. He stands his best chance on the ground. Max, on the other hand, will want to do exactly the opposite. He will want to circle and use his footwork to stay as far away from Khabib as possible while dealing damage primarily with his punches. I’d like to see him use his precise in and out movement and length with his dangerous straight punches. I’m personally afraid for his affinity for spinning kicks despite their elite development because I believe that would be an opportunity for Khabib to take the fight to the ground as Max’s back turns to him. My heart screams for a Max Holloway victory and new CHAMP CHAMP, however, my brain tells me that Khabib will smash and grind for 5 rounds to a unanimous decision victory. To be fair, there is also a real likelihood of him getting a stoppage in the second half of the fight due to attrition. Our Prediction: Khabib Nurmagomedov, 5 round unanimous decision win, new lightweight world champion. This matchup is one of technical nuance and mental strategy for me. In the first fight, Rose and her coaches saw a technical flaw of Joanna’s that they capitalized on to great success, the opening for the left hook. They knew that Joanna’s extensive Muay Thai and kickboxing background came with the tendency to push away with both hands when opponents attempt to close the distance on her. With big boxing gloves on in Muay Thai and Kickboxing, the shoulder is enough to block incoming shots in this position and the arms serve as a distance barrier. A tactic that is used to great success in most professional fighters in those sports. In MMA, however, the gloves are smaller and can fit into tighter spaces. The MMA gloves can fit right over the top of that shoulder and when Joanna pushed out to manage distance as Rose moved forward to get close, she opened up the fight ending opening for the left hook that saw Rose crowned as the underdog champion. This is the type of technical nuance that made both of these lady’s champions. On the mental end of the fight, Joanna seemed to have some trouble gaining ground on Rose in the lead up to their last fight. She turned up the noise more and more as the fight came closer and closer and we saw the usually intimidating strawweight champion hit a mental brick wall reciting the lord’s prayer in Rose Namajunas. She was steely and unaffected. She didn’t give one inch. I think this impacted Joanna’s mental outlook on the fight and didn’t allow her to come in and attack as confidently as she has in the past. But what do I know, these are basically all assumptions. There is one physical aspect that needs to be addressed as well. It came out after the first fight that Joanna apparently had a grueling 14-hour weight cut that significantly diminished her. She recalled looking back on her 100-odd fights and never got dropped. She has said in popular media that she knows it affected her and that it won’t be an issue this time around. So, was it the technical nuance that won the fight? Was the mental toughness of Rose beforehand that did it? Or was it the grueling weight cut of Joanna? More likely, it was a combination of all these things. Joanna seems less stressed about getting into her opponent’s head this time around and is more focused on a healthy weight cut. Joanna is currently my favorite fighter in the UFC and it’s hard to pick against her, but I am. Rose Namajunas, a face punch, then she takes the back and gets the choke. First half of the fight! Our Predictions: Rose Namajunas via submission after rocking Joanna in the first half of the fight.